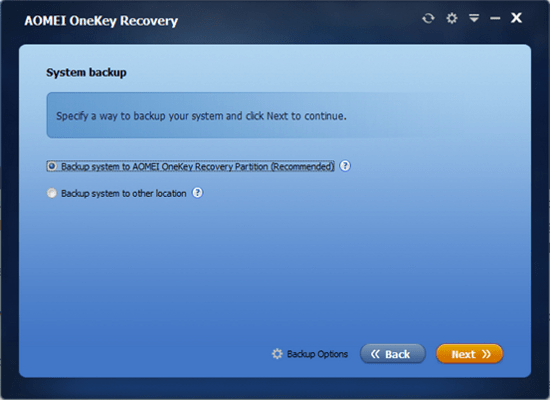 AOMEI OneKey Recovery is an easy to use Windows system backup & restore software. Few clicks you can make a system image file, one click you can do recovery. It is a fast and convenient backup&restore system tool for lazy man. With AOMEI OneKey Recovery you will be able to recover Operating System and most important applications downloaded and disk drivers. AOMEI OneKey Recovery has 5 editions with different feature and the Professional version is best fit for home and expert user’s works for 1 Windows PC system and no support for windows server. If you don’t want to spend lots of time to do backup, only backup system is OK. AOMEI OneKey Recovery is such a tool to help you complete this task. Besides these, different editions of AOMEI OneKey Recovery provide more choices and functions, please choose a one according to your needs. The latest version of AOMEI OneKey Recovery is 1.6, it has five editions, one freeware, four paid. If you just want to make a system backup in case of crash, so that you can recover quickly and not so much about it, AOMEI OneKey Recovery Free Edition is enough. If you want to backup to other location and restore from external had disk or USB flash drive, you should buy AOMEI OneKey Recovery Professional. With this edition, you can compress the image file, encrypt the backup. When restoring, you are able to select an image file. Unluckily, Professional Edition still does not support Windows Server. For Windows Server operating systems, you should try AOMEI OneKey Recovery Premium Edition. This edition supports 4 PCs or Servers. If you are an administrator who manage multiple computers in a company or a lab, and you want to backup all your systems, we suggest you to try AOMEI OneKey Recovery Technician, which supports unlimited PCs and supports lifetime free upgrade. The last edition – AOMEI OneKey Recovery customization, supports both PC and Server, also unlimited. What’s more, this edition allows you to customize UI & logo, rebrand for OEM installs. General customization includes contents as follow, mainly about texts.